I'm not that keen on the colours of this page. But I have to accept that I won't love all my pages. I wanted a sand and sea type colour scheme - which is there, it's just not as harmonious as I would like. The round circles are cut from my first ever Gelli Prints down with my new Gelli plate. It was my birthday present and I'm loving using it. These are just the first few efforts, and the ones I did last night are nicer. They will probably appear in later pages. Now that I look at it ... I think the reason I'm not in love with this page is that the sandy colour is very flat. It might have looked better if I had used some textures and layered it up a bit with some stamps or stencils. I was just so excited about using those Gelli prints that I rushed it I think. Not to worry ... we live and learn. I like these pages a lot. You feel the sandy color is too flat, I think it is great. 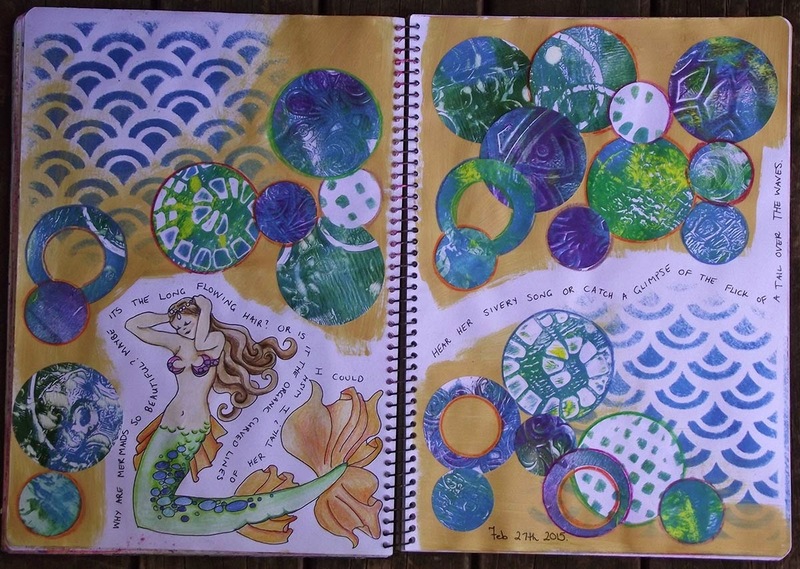 It lets your mermaid and Gelli prints take center stage with out a fight.. Thanks Krisha, I think we all see different things in one anothers art.